We offer exceptional quality, personal attention and outstanding selection and prices. Find your perfect piece of custom jewelry here: buy it already made or create your own. Create your own perfect Engagement ring. Choose among a variety of our Men’s rings and custom build your own Signet Ring. Avoid the middle men! We manufacture all the jewelry we sell and that means you get better prices. 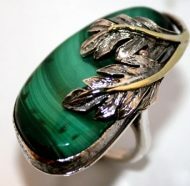 Every item is hand made by Vladimir Chakharian a designer, engraver and creator of fine jewelry over 40 years. When you want elegantly crafted jewelry designed to match your style and the way you live, Almari Design is just what you are looking for. Fast shipping anywhere in US and Canada. International buyers please contact us first for shipping information. RING LEADER The stunning handwork of Vladimir Chakharian and Almari Design. Written by Sarah B. Hood from Canadian Jeweler. Call us 1-877-787-8914 or 1-778-554-8787 for more questions or special requests. The “rules” and common etiquette of signet ring wearing is highly discussed topic by our clients. While the same can be said for other rings, these debates are more prominent in the world of signet rings because their they are laced with a very rich history and culture. However, one important fact about the history of signet rings and what placement is “right” is convoluted. The reasoning for this is that placement has always varied by culture, religion, and geographical region. For example, in the UK, signet rings are more traditionally work on the thinnest finger (usually the pinky, of course) of the non-dominant hand. However, in Switzerland, the rules change a little bit. Traditionally in Switzerland, men will wear their custom signet rings on the right hand, no matter which hand is your dominant one. Two contrast, men in France almost all exclusively wear their signet ring on the left hand. 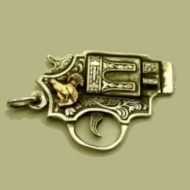 There are endless amounts of graphics, scripts, and icons you can use to great an image for your engraving on your signet ring. 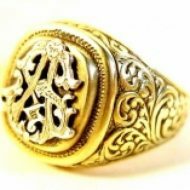 Way back when, it was typical to having your family crest be your engraving on your signet ring, but now a days, we are offered many more options and freedoms with our custom made signet rings. There is but one rule to signet engraving: pick a design, but keep it clean and simple. 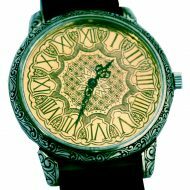 Over complicating designs is the engraving nightmare, and could make your image look unnecessarily convoluted and clustered. Here, Almari Designs gives you ideas on your signet ring engraving. 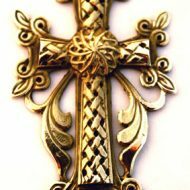 The most common and go-to request for engraving is names. First names, last names, nick names, all of these are very viable for engraving on your signet ring. As long as the script is not overly complicated or detailed, it is easy to accommodate signet rings for spacing and design with text based designs. 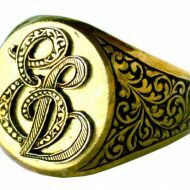 There are many fonts out there that suit the look of custom signet rings, and many signet ring wearers adore the look of cursive fonts on their rings. Even doing a simple Google search of fonts will yield you with many options, so do some research and find a font that you fall in love with. 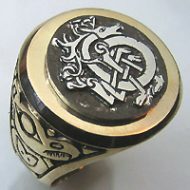 Each type of metal used for making signet rings carries it’s own unique set of pro’s, but also their own set of cons. Are you having a custom made signet ring done for you? While this be a family heirloom, passed down from generation to generation? What kind of material would benefit you, personally, best of all? 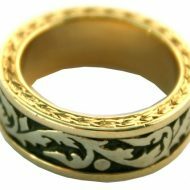 Here is the Almari Design guide to signet ring metals and materials! We are seeing more demand now for wedding signet rings. 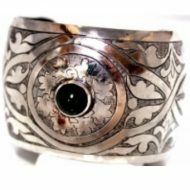 It is becoming harder and harder to come across truly unique and interesting wedding rings. It seems that they all look very similar these days. Are you searching for a more unique option for your wedding ring that makes a statement? A custom made signet ring might be right for you. Signet rings are traditional, highly customizable, and carry a rich historical and cultural connotation that will bring meaning and depth to your wedding ring. I wanted to express my sincere gratitude for the ring you made me. Even though my expectations were high, you far exceeded them in every way. Your patience and guidance has resulted in an heirloom that I hope will be in my family for many generations . 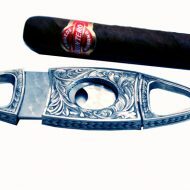 Craftsmanship, dedication, and pride in ones work are rare traits that you possess in spades. You are a true artist with honesty and integrity and I hope you will continue for many years to come. I will recommend you without hesitation to others and plan on future commissions myself. I only wish I were closer so I could come by and see you work! British Columbia, V3H 2P6, Canada. 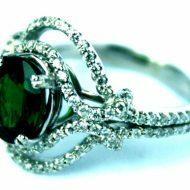 Let us know what custom jewelry you are looking for and what is your desired budget. We reply promptly. © 2017 Almari Design. All Rights Reserved.  Developed Web Masters Corp.